Inept and insipid are a couple of words that spring to mind after Tuesday’s FA cup game. When I have returned home after yet another let down at the Kassam Stadium I’ve until now felt some kind of cathartic release by immediately banging away on my keyboard. But not this time. It’s gone beyond that. I’ve been worn down and feel empty inside. The banner in the North Stand proclaimed “Glory, Glory”. It’s a pity the players and management didn’t glance in that direction and ponder on its meaning. 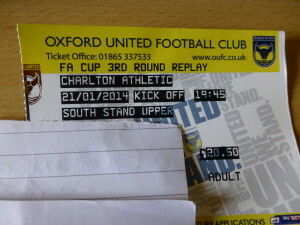 A post match text from Murph the Charlton fan declared “Oxford never turned up”. How right he was. For the first half hour I didn’t think the Addicks had turned up either. Even though we were extremely poor I was beginning to think that we had a chance of going through because they were little better and had not created any chance worthy of the name. Then they scored and three minutes later they scored again. I usually watch goals for and against again on TV but didn’t after this debacle. I couldn’t bear it. It now became obvious that they were better than us. They had it in them to come back from 2 down. We didn’t. So, “2-0 and you f****d it up” was true. The game was already dead but before the hour mark it died some more when Yann Kermorgant (he of the Leicester chipped penalty fame) score his second with a free kick from distance. At 9:20 we managed our first shot on target. It was Beano from distance. He managed a bit of power but was never going to beat the keeper, particularly when it was straight at him. Josh Ruffels was our only player to come out of this with credit. Not only did we not play any football at all we showed no passion whatsoever. What was the point of the trips to Gateshead and Wrexham and the demonstration of guts and determination that was required to make it to the 3rd round if we were to go out in such a pathetic fashion? As for the defence, well they let in three. In midfield alongside Ruffels, Johnny Mullins is a defender and Scott Davies was back to being not very good. As was Sean Rigg. Other than the game at the Valley he has been a shadow of his former self since returning from injury. I really don’t like being constantly negative about particular players but I really want to scream when I see Deane Smalley. The value we’ve got out of him is atrocious and yet we gave him another contract. And Beano was no better really either was he? No more than a Conference player on this and other recent showings? To those who say, yes but they get no service I’ll say this – If Beano, Deano & Riggy were any good they should be able to create something between themselves. They constitute 30% of our outfield contingent. Without Kitson’s extra quality and class and the pace and excitement Ryan Williams brings, what do we have? They were injured but I was a bit baffled as to why no Danny Rose. Charlton never let us play. They closed us down quickly. But this is so very very easy for any visiting team because we play at pedestrian pace. We’re so slow in our movement of the ball and attacking (not that we did any). We don’t do the same to the opposition. Coaching? You’d have thought our boys had never seen a coach in their life. Game plan / tactics to try and win the game, you must be joking. Playing a Championship side on our own patch in the FA Cup in normal circumstances should have brought the crowd out in something approaching droves, but given the way things are I was expecting a poor turnout of about 5k for this game. What we got was even more shocking with only 2642 home fans bothering to come along. After the game I heard a pensioner say to the guy he was with “we need a change of manager”. He wasn’t ranting and raging but just saying what most people feel after every home game. (Away games of course have been very different). But, “He’s got to go. It’s the home form and that’s what brings the money in” was also heard and many have been arguing that for a while now. I also heard, “Promotion, no, no ,no. That’s the last thing I want because it would mean Wilder getting a new contract. I couldn’t face it”. Selfie on Radio Oxford articulated it all very well by turning the number of games played at the Kassam into minutes and then working out how many of those minutes we’d been any good in. I think it was something like 1440: just over a 100. Scary stuff but we know what we’ve been subjected to. So let’s have a think about what’s occurring. All Chris Wilder’s fault for the mockery of a football team we are at home? If so he deserves all the credit going for what we’ve become on our travels, it’s only fair. But there’s at least two sides to every story and I’m hearing things from (possibly) reasonably reliable sources that put a slightly different slant on things. The manager had done a deal to get a senior pro out on a permanent deal (I’d have been happy with this). The manager had done a deal to get one of the development squad out on a loan. (I’d have been happy with this too). But I’m hearing that this was blocked by the Chairman. Then I’m being reminded that Ian is not the only Lenagan around. It doesn’t sound good to me. Ok, the news was out before I’d written this but I’ll come on to that significant event after I’ve banged out views on the game versus the Gulls, because there was a game and we got a home win, hoorah! Did we deserve it? Yes. Was it anything to write home about? No. 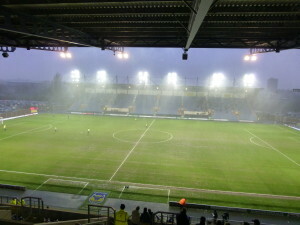 Was there anything there to suggest that we might have cracked the Kassam hoodoo? No. We deserved it because of the first 10-15 minutes. For once we actually started in positive fashion and took the game to the Devonians who hardly had a kick. Going forward instead of sideways, sideways, backwards helped. Ryan Williams, in (tiny) samurai warrior pose, was instrumental in this. Boy do we miss him when he’s absent. Everyone, Ruffels aside (see above), played so much better than four days earlier. Beano was showing reasonable control and Smalley was looking like a useful footballer with movement and popped the goal in. It all helps with this going forward thing. Other than the goal, chances were certainly not plentiful. In the first half Smalley looked odds on to poke it round Michael in the Torquay goal but the keeper made a fantastic save. In the second half Smalley had another chance, created by Williams and that was about it. Torquay were very poor and their only chance was the free kick just before the end when they hit the bar before Jake Wright saved two points with the sort of defending that separates winners from losers (drawers?). For his pains I thought he was fouled but another clueless referee was having none of it. Speedy recovery Jake. We knew something was coming and it was always going to happen at some stage. Managers come and go, but fans, for the most part, stay. But, the way Ian Lenagan told it on Radio Oxford, it was all rather strange. There has to have been some kind of falling out doesn’t there? Lenagan talks a good game but when he starts mentioning Tyrone Marsh I get concerned. Chris Wilder deserves a huge amount of credit for getting us back in the Football League and for the phenomenal away record in 2013/14. That says job for (almost) life. The other side of the coin is the home form – results and entertainment. That says, sack now. It was a very bizarre juxtaposition. One thing he hasn’t deserved is the abuse he has been getting from some quarters for some time now and the abuse he is continuing to get. I could probably write pages on this latest episode in the soap opera that is Oxford United, and may well come back to this, but think for now it’s best to step back and go into contemplation mode and trying to work out whether he had actually gone or not. Finally I’d like to make three points. Secondly there’s a game with three points at stake at Exeter on Tuesday night. Thirdly, it’s that old saying. “Be careful what you wish for”. There are better managers out there than Chris Wilder, of course there are. But there are also plenty who are a lot worse. This entry was posted on Sunday, January 26th, 2014 at 10:41 pm and appears under 2013, News Items. Both comments and pings are currently closed.